I’d like to say “Happy Holidays” but for some of you it’s not going to be a happy holiday. I know how hard it can be having a family member with serious mental illness or being a person with serious mental illness. But we learn from the experience. And it gives us solace to try to make their lives better. Mental Illness Policy Org thanks you for all you do to improve care for the seriously ill and for your support of our efforts. Here’s a recap of some of our efforts in 2017 that hopefully complemented your own. We encouraged President Trump to appoint an Assistant Secretary of Mental Health who will focus federal agencies on improving care for the seriously mentally ill. He did that when he appointed Dr. Elinore McCance-Katz. As a result of our previous support for Assisted Outpatient Treatment, this year SAMHSA gave out multiple multi-million dollar grants to start pilot programs. Ideas that we proposed to make it easier to treat the seriously ill were included in the first report of the federal Interdepartmental Serious Mental Illness Coordinating Committee and will hopefully become part of federal policy. I wrote in National Review that people with untreated serious mental illness are more violent than others and that to deny it is stigmatizing and prevents them from getting care. In September, I argued in Real Clear Health (part of Real Clear Politics) that we are going after suicide in all the wrong ways. Our April oped in The Hill argued that it is dangerous to adopt “celebrity-centric” mental health policies. We released a report co-authored by Dr. E. Fuller Torrey titled, “State Mental Health Spending: Is Your State Naughty or Nice?” that rates states based on the percentage of their state spending allocated to mental health. Advocates can use it to lobby for increased spending and more effective spending. In Florida, Maine, Tennessee, New Jersey, and Louisiana, I was invited by advocates and criminal justice officials to give speeches centered around the ideas in Insane Consequences. In some cases I went with them to visit legislators and editorial boards. In New York, we were successful in having Kendra’s Law renewed, added to our NY specific website; wrote numerous opeds in the New York Post, Daily News and City Journal that highlighted why Mayor de Blasios expensive mental health plan is failing (Hint: it doesn’t focus on the seriously ill). Our work has continued to benefit from the research, connections, and commitment of Manhattan Institute, a think-tank that compassionately made better care for the seriously mentally ill an important part of their agenda. They hosted multiple forums and events for key influencers that showcased Mental Illness Policy Org and their own scholarship. In California, we continued to help well-organized advocates by updating our California website with county-specific information, speaking in multiple venues, visiting editorial boards and writing an oped in Foxes and Hounds that attempts to enlist the business community in focusing resources on the seriously ill.
Arizona Senator Nancy Barto (R) made improved services for the seriously mentally ill an important part of her campaign and made useful introductions for us. Iowa gubernatorial candidate Andy McGuire (D) has also committed to smart mental illness policies. Three candidates in New York City’s 2017 mayoral race incorporated our suggestions in their mental health platforms. In California, Stephen Jaffe (no-relation) who is running for Congress in a primary race against Nancy Pelosi, has a long history of supporting improved care for the most seriously mentally ill and has consulted with us. In addition to writing opeds, and being interviewed for newspapers, there were numerous live events. Manhattan Institute put on a book launch for Insane Consequences at the Yale Club; a mental illness forum at the Harvard Club with Pete Earley, Assistant Secretary Dr. McCance-Katz, and myself; and a large forum moderated by Errol Louis, where I got to debate NYC’s top mental health official on their failures. Those are just some of the highlights. 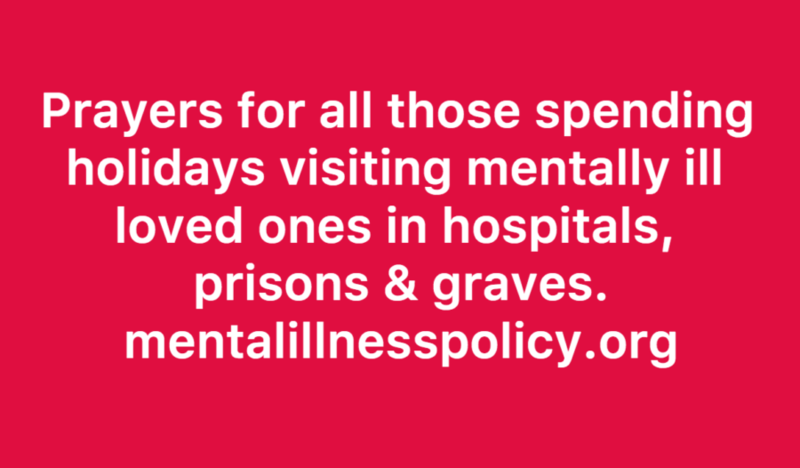 A big thank you to all those (mainly moms and dads) who are working so hard to change the system, while providing care for their own seriously mentally ill loved ones. While we were able to accomplish a lot, it would not be accurate to say that treatment of the seriously mentally ill is getting better. But none of us is giving up. We will work even harder in 2018. Thank you for your support.